The principle structures of this church are the typical 14th century arcading and the grandiose 15th century tower. But there was a church here in earlier times and it is proved by two important items of evidence of Christianity. In 1960 a Romano-British cemetery was excavated near here and some Christian burials were found about 4th/5th century and in Saxon times King Edgar conveyed the patronage of the church to the Abbey of Ramsey. Also the amount of ironbound conglomerate throughout the building indicates almost certainly a Saxon building on this site. Remains of two Norman windows have been found in the south side of the west end of the chancel. They have been dated as 12th century and are blocked in with stone from the Roman Fort of Branodunum which was situated half a mile east of the church (and whose commander was the Count of the Saxon Shore). The date the Roman stone was used in the 12th century west end is unclear but the east end of the chancel was added c.1405 and it was probable that the Roman stone was used at this time. Portions of two round headed windows can be seen on the left of the picture, blocked with the stone. More examples can be seen on the east end where it was used as facing stone. The south aisle with its east window, seen in the photo, is said to be 13th century and that the porch dates from c. 1300. The weathered headstops on the south door, however, suggest that it stood for some time without a porch. 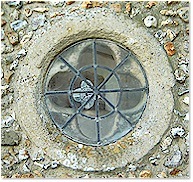 These headstops are very similar to those on the south aisle windows. The porch dated at 1300 is earlier than most porches and it has a pair of pretty little windows which are set off by special glazing. They are quatrefoils within circles from one side and circles within quatrefoils from the reverse side. Both windows can be seen on the right, one through the other, showing the interesting shapes. The arcades are dated to around 1400 and the chancel arch is of the same build, although it has been cut for the rood screen at a subsequent date when rood screens became popular in the 15th century. That is the style of the remaining fragment now placed across the tower arch. As with most churches St. Mary's suffered some decay in the 18th century. The chancel was restored in the 19th century and the east window replaced in 1907. 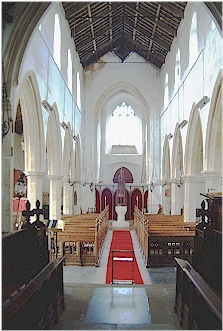 The roof of the nave and also that of the chancel were restored in the 19th century. High up under the roof on the west wall is a wooden clockface, known as a preacher's dial, placed there for the preacher to be aware of the time. There is local belief that there was, up until 1832, a hammerbeam roof and that the carved figure of St. Matthew on the wall inside the south door stood for years on a wallpost looking down into the nave. Certainly his head is at a strange angle. St. Matthew has his gospel in one hand and a money bag in the other. Was he, perhaps, one of 12 apostles or one of the four gospel writers under such a hammerbeam roof? He can be seen on the right. The Edwardian pews of the church were given in 1904 by members of the Royal West Norfolk Golf Club whose clubhouse and links are out on the sand dunes of Brancaster Bay. The Victorian east window is a glorious portrayal of Christ throned in Glory. In the upper part He is surrounded by adoring angels with mortals occupying the lower section. 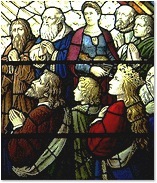 The window commemorates the tragic death of the Rector's young wife at the age of 34 in 1907 and she is included among the mortals and can be seen holding a violin on the left. The church clock which faces both east and west in the tower was given by the parishioners in 1907, also in memory of Mrs. Daubney. The font is plain and octagonal and of traditional mediaeval design. It has, however, a remarkable cover of finials and crockets which telescopes up over itself. A bequest for this by Walter Bodham was noted in 1493. It has, of course, been necessary to restore such delicate workmanship during the last 500 years. It is now supported on a modern iron frame. 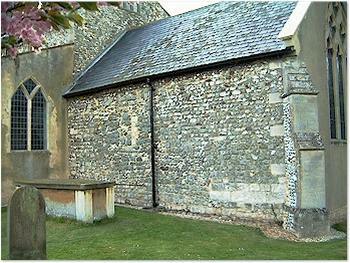 There are two 17th century almsboxes standing near to the north and south doors of the church. They are cut from tree trunks and have three iron hasps because the Rector and both churchwardens had to be present to open them. There is a bier at the back of the south aisle, just to the right of the door. This dates from the early part of the 20th century when the cemetery, a quarter of a mile away up on Mill Hill, came into use. W.V. Bunkle, a member of the Parish Council and the Parochial Church Council, had proposed the providing of a bier to wheel coffins up the hill to the cemetery instead of being carried on the shoulders of pall-bearers. It was made at Joe Powells' agricultural engineering works in Brancaster. The Royal Arms hang above the vestry door in the north west corner of the church. 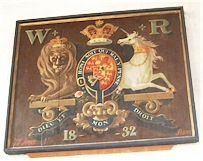 The Arms, seen below, are clearly dated 1832 and refer to William IV. Lying on the floor slabs are four ancient brasses. One in the centre of the chancel floor is inscribed 'Pray for the soul of Master William Cotyng sometime Rector of this church who now sleeps in the dust awaiting his salvation who died 1480'. A space was left for the exact date of his death, but this was never added. The memorial appeared to have been made 5 years prior to his death which was recorded as 1485. There are two brasses with Latin inscriptions and one with a rhyming epitaph which tells how Robert Smith gave the parish a school, almshouse and coal charity. He died in 1596 and the schoolhouse and almshouses are still in Brancaster today opposite the church. A new school is now voluntary aided Cof E, but the almshouses, now in London Street, and coal charity are still operated by this local Robert Smith Trust of 1596. The organ is a fine two-manual instrument made in 1912 by Wordsworth Company of Leeds. 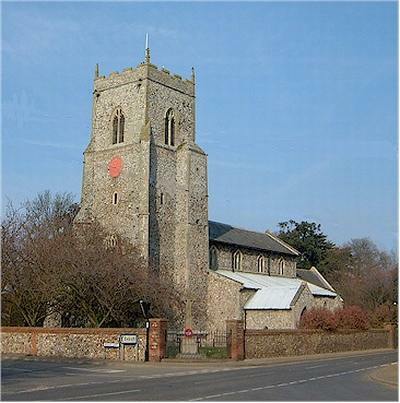 Brancaster Church is at the heart of the Brancaster Midsummer Music Festival held annually in the district and the organ is played by national and international artistes also giving concerts at other times.